Hollow Rod Cylinders are ideal for converting existing fixtures to power clamping. Replaces clamps which use double cams, flange nuts, draw bars, or other mechanical devices. Generally, no special machining is required, just a longer stud. Hollow Rod Cylinders can either push or pull. Two styles are available, either Through Hole or Tapped Hole. In the Through Hole style, the piston rod is hollow to accept a bolt. The Tapped Hole cylinders accept a bolt threaded into the piston. 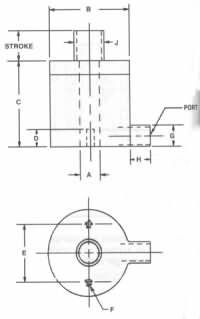 Because of the piston design, the Tapped Hole style cannot gain stroke. Removing the return springs make the Hollow Rod Cylinders suitable for air operation.